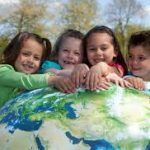 Teach Our Kids About Water | Granite Drilling Co. When my kids were little, they enjoyed spending time with their dad out on the job site. They loved driving in the big trucks, playing in the mud, and most of all, asking me questions about water – “Where does water come from; how do you find the water, how much water is there on Earth?” If you have kids like mine, luckily, the Groundwater Foundation, provides some fun, useful material to teach your kids about water – groundwater, geology, water wells, and sustainability. In fact, much of their material is great for adults too! Check out these 2 links and see how you do! The more we can teach our youth about water, the better off our planet will be. Enjoy!